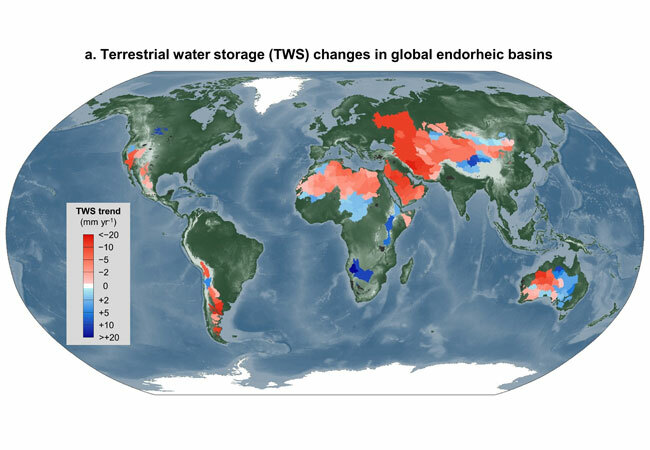 The study, „Recent Global Decline in Endorheic Basin Water Storage,“ was carried out by an international team of scientists, including Hannes Mueller Schmied from Goethe University, and appears in the current issue of Nature Geoscience. „Water resources are extremely limited in the continental hinterlands where streamflow does not reach the ocean. Scientifically, these regions are called endorheic basins,“ said Jida Wang, a Kansas State University geographer and the study’s lead author. Monthly net terrestrial water storage anomalies in gigatonnes, in global endorheic and exorheic systems — excluding Greenland, Antarctica and the oceans —and linkage to the El Niño-Southern Oscillation, right axis. .
“The water losses from the world’s endorheic basins are yet another example of how climate change is further drying the already dry arid and semi-arid regions of the globe. Meanwhile, human activities such as groundwater depletion are significantly accelerating this drying,“ said Jay Famiglietti, director of the Global Institute of Water Security, Canada 150 research chair in hydrology and remote sensing at the University of Saskatchewan, Canada and co-author of the study. 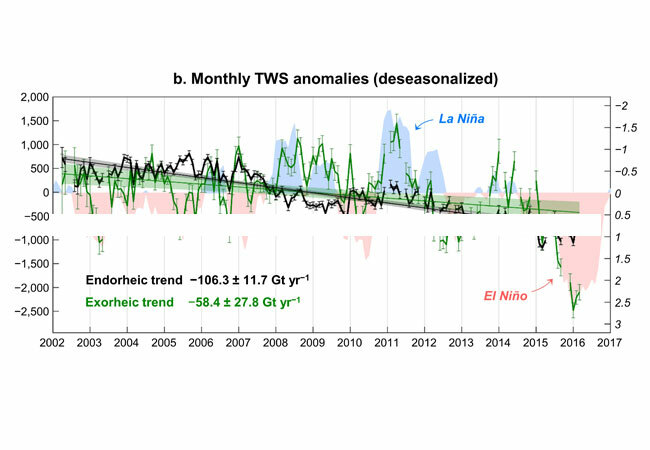 „First, water storage in the endorheic system, albeit limited in total mass, can dominate the water storage trend in the entire land surface during at least decadal timescales,“ Wang said. „Second, the recent endorheic water loss is less sensitive to natural variability of the climate system, suggesting a possible response to longer-term climate conditions and human water management. Along with Wang, Song, Wada and Famiglietti, the research team also includes John T. Reager from the Jet Propulsion Laboratory at the California Institute of Technology;Fangfang Yao, doctoral student in geography, and Richard Marston, university distinguished professor emeritus of geography, both from Kansas State University; Yongwei Sheng from the geography department, and Glen MacDonald, geography and the ecology and evolutionary biology departments, both at the University of California at Los Angeles; Fanny Brunfrom the University of Grenoble Alpes, Grenoble, France, and LEGOS in Toulouse, France; and Hannes Müller Schmied from the Institute of Physical Geography at Goethe University in Frankfurt,Germany, and Senckenberg Biodiversity and Climate Research Center in Germany.